Eric Ashley manages the oil and gas law department of the firm. He advises our clients on various oil and gas legal, regulatory, and financing issues. He helps clients identify and resolve issues relating to the acquisition, exploration, development, and divestiture of oil and gas assets and advises clients on mitigating the business risks of drilling and producing oil and gas wells. Practicing in Texas, Louisiana, and New Mexico, Eric has extensive experience examining surface, mineral, and leasehold title on tracts of land of all sizes and complexities. Since graduating from law school, Eric has worked exclusively in the field of oil and gas law. 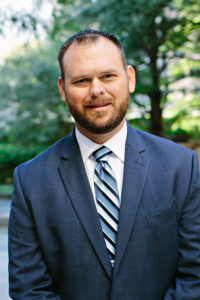 He has experience in oil and gas title examination throughout the State of Texas, including South Texas, the Eagle Ford Shale, the Permian Basin, the Barnett Shale, and East Texas. His background includes stand-up title examination and the rendering of Original Drilling, Supplemental, Division Order, Limited Leasehold, and Acquisition Title Opinions, including the preparation of curative instruments. Eric graduated from the University of Texas at San Antonio in 2003 with a degree in Political Science and a minor in Legal Studies. He earned his Doctor of Jurisprudence from St. Mary’s University School of Law in 2007 where he was an Associate Editor of the St. Mary’s Law Journal and a Student Attorney for the Center for Legal and Social Justice, Civil Justice Clinic.